I am very happy and excited. A couple of months ago I started this little blog to ramble about my nail and deco obsessions and already I have made some really lovely new friends and found many fellow bloggers who share the same interests. And today I realised that 51 of you found my ramblings interesting enough to follow. To everyone who is following this blog or even passed by and left a comment or even took a look, I want to say thank you. So I am going to have a small giveaway because I want to give something back to all of you. The giveaway is international so everyone can enter. All these goodies have been purchased or made by me. And here is what's up for grabs. The giveaway will last until August 10. As long as it is August 10 anywhere on the planet this giveaway will be open. After the winner is chosen via random.org I will contact them by email. Please reply within 3 days or another winner will be chosen. 1. You must be a public follower via Google Friends Connect (new followers are most welcome ^_^). Please leave your username and email so I can contact you. For extra entries you can do the following. I would love to win some nail pretties! Wow cel looks like a great giveaway!! Looks like a pretty big giveway to me. :) Congratulations on reaching 50+ followers. I follow as KarenD (the.karend at gmail dot com) and your are in my blogroll (most recent updated shows as default, but clicking Show All shows the rest). I already follow you via GFC: 'chelle. I've posted about your great giveaway on my giveaway sidebar on my blog http://cosmeticcupcake.com. And you're already on my blogroll because I love your blog! I should be following you too on facebook now as Michelle. Nail addicts giveaway indeed!I waaaaaant them! Hello Cel =) I'm following you and you're on my blogroll =) Thank you for your generous opportunity! I'm following you through gfc, name is shazzii. Email: forever.infatuated at gmail dot com. You're also on my blogroll. *I'm a follower with GFC. *Put your giveaway on my sidebar. *added you to my blogroll. - I'm a follower via GFC. Hey i am already your follower and now i would love to have these amazing gifts! +1 I am now following you on Facebook under: Nicole O.
Hy, I`m a follower via GFC: Andreea ! i am a new follower though GFC. Enter me please! I'm a follower via GFC as Victoria. From one nail addict to another, thank you for this superlicious giveaway! I'm a new follower, thank you. I'm a new follower via GFC. Thanks for the chance! I already follow you via GFC: joias by ille. I should be following you too on facebook now as Ileana Schor. Hi, I am a new follower :). Enter me please! I'm a new follower via GFC, following as fisiwoman. I am a new follower, via google, Jackie S.
Hello I am French and I share in your giveaways, I am follower (elodie Deloye) my email is isis70_6@hotmail.fr. You are in my blogroll (http://amstramgrampikepik.over-blog.com/pages/vos-blogs-3410471.html) and a section is devoted to your giveaways with a photograph (http://amstramgrampikepik.over-blog. com/pages/giveaways-3450356.html), thank you very much! I`m following on google friend connect. Please enter me! I follow with GFC, username mjl1124, email mayliao1124@gmail.com. Hi! I'm a new follower on GFC under Joanna O.
I like'd your FB page from Joanna O. That case you decorated is really cute, btw! I'm a new follower as: Cláudia Mendonça. I am a follwer via GFC, my name is Tess. I liked your facebook, name is Tess Rudolphy. Congrats on all your new followers! and i added you on my blogroll. Hi i am a new follower :) with the name Frankie. - I am new follower. I am a follower via GFC and my email is alexa12_02@yahoo.com. I also added you on my blogrool and blogged about the giveaway here: http://alexa1202.blogspot.com/2010/07/cels-nail-addicts-giveaway.html. I am a follower via GFC and my email is carina_nina1@hotmail.com . I also blogged about your giveaway here: http://paintedgates.blogspot.com/2010/07/mais-uns-sorteios-d-more-giveaways-d.html . and I have added you to my own blogroll. and added you to my blogroll, too! good luck to me! yay! Hi! :) I'm a follower and you're on my blogroll (favorite blogs page). became a facebook fan as Grace Wong. I am a follower via Google, Serena Thornbrugh. I also follow you on facebook with the name Serena Thornbrugh. I added your blog to my "Blogs I Read" section: http://lacquerloveblog.blogspot.com. Hi I'm a follower! !Well now I am! following your blog by the google friend connect name 'Ezzy'. I ppst your giveaway in sidebar. I follow you via GFC as ana a.
I'm a new follower (Jo), my e-mail is jo.lifeandlove@gmail.com and... enter me, please! I just became a follower! Great giveaway! Your giveaway is just great! I'm a google friend follower. Name used is StampingNails. Please enter me :D This stuff is awesome. My name is Olivia Keegan. I also am a fan of your lovely blog on Facebook. My FB username is "Olivia Marie". pls enter me in!! ima follower via GFC! thanks!! and more power to ur blog!! I'm a follower via GFC (Taya). My email is: tgjerkes(at)gmail(dot)com. Your blog is on my blogroll (Berem). And I added you to my blogroll! I'm a follower via GFC...megaroonie, margaretv99@gmail.com. I also liked you on Facebook- Margaret Shockley Vollmer. Such a cool giveaway, ty! A beautiful blog and a great giveaway! It's a nice giveaway ! I'm Google Follower "Freshie" my email is PolishFreshie at AOL.com. 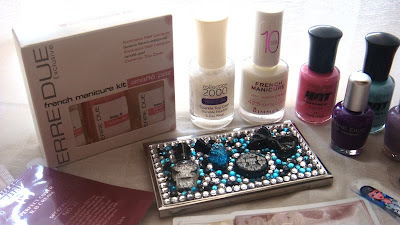 I've also added you to my blogroll at http://polishfreshie.blogspot.com. Ya estás en mi blog, columna derecha.